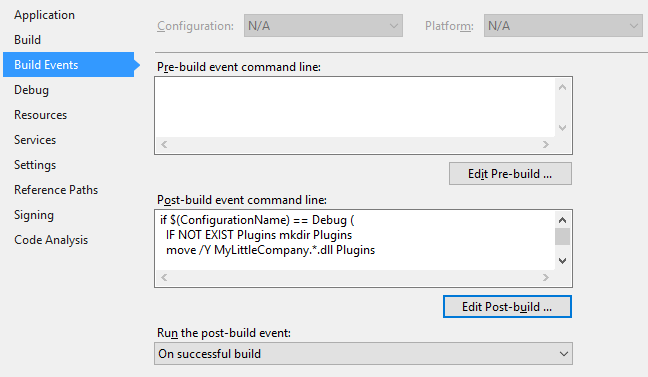 To make debugging from Visual Studio possible, a few things must be configured correctly. Add a Post-build event to create a Plugins sub-folder and copy you plugin dll there, where XrmToolBox can find the plugin assemblies. Define external program to start for debugging. This specifies that you wan't to use the build folder as the root folder for XrmToolBox and not the user's AppData. /connection:"[Connection Name]" The organization that XrmToolBox should connect to when it starts. /plugin:"[Plugin Name]" The name of the plugin you are developing. This is the value in ExportMetaData attribute.